I was very honoured when my writing mentor John Simmons asked me to guest post on his blog 26 Fruits. I frequently refer to his books on writing, including 26 Ways of looking at a Blackberry in my job as a copywriter, and always look forward to his weekly posts. 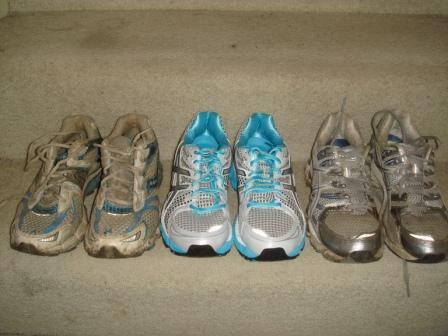 So this week, having made a return to writing about running, it feels very appropriate to redirect you to John’s blog, where you’ll find my guest post on the connections between running and writing. How the different communities I’m part of inspire my writing for business and personal enjoyment. Writing is often perceived as a solitary occupation, and there are times when all I need is my notebook and a pen. Having worked as a journalist in radio and TV newsrooms, writing copy for the next bulletin against the background of on air broadcasts, telephones ringing and a dozen conversations going on at once, for me, even peace and quiet is optional. Although I do prefer it if I have thinking to do. But recently I’ve been reflecting on communities and how the different ones I belong to all inspire my writing. I’m part of the running and triathlon community in the North East of England and beyond. Through doing parkrun, races and by being a member of a very friendly online running site, I can pretty much guarantee that if I turn up at a local race, I’ll see someone I know. I started to write about local races as a way of recording my own progress, or to remember a particular feature of a race, such as leg-sapping sand or a steep hill, for the next time. So it’s lovely when I get comments from other runners who read my race reports and say they’ve helped them. Running also brought me back to personal writing after a long break away from it. I believe my professional writing is richer for it. I’ve felt more part of a writing community since joining 26. The regular newsletters, articles and suggestions for books to read or things to see are a great source of inspiration. As too are the opportunities to get involved in 26 creative writing projects. I jumped in first as a writer, contributing a piece for 26 Characters as part of a magical exhibition at the Story Museum in Oxford. Then more recently, I co-edited 26 Under A Northern Sky with Sandy Wilkie and got the opportunity to work with other amazing writers to launch a collection of creative writing inspired by a train journey from Newcastle to Glasgow and the music of Nick Drake. I’m delighted that this project is currently taking on a life of its own, beyond my editorial influence, as writers are recording their pieces and adding them to an online soundscape. 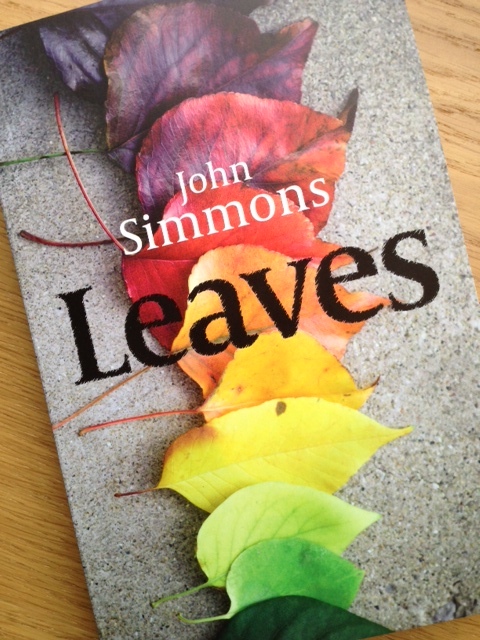 Community is also a theme in John Simmons’ beautiful debut novel, ‘Leaves’ – my current reading material. It’s set on one street in London in the 1970s. The characters observed and imagined by the narrator looking back at events in his life. I have only just started reading, and admit, I’m trying to ration my time among the pages, as I have a flight and airport time coming up and I know the inhabitants of Ophelia Street will be welcome company. John has been posting a daily extract from the book on Twitter, which is a delightful tease. Each sentence seems to offer a short story in itself, but has left me wanting to read more. It merits a slow, careful reading to savour every word. Finally there’s my real community. The place where I live. 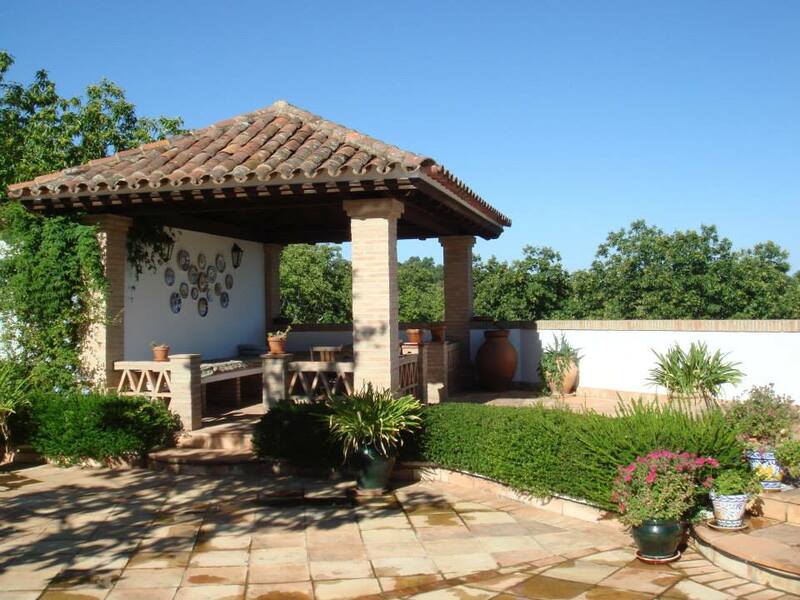 Within five minutes walk from my front door, I can be among a range of small businesses, from coffee and gift shops, to restaurants, guest houses, food outlets, and an art gallery. I enjoy a browse and a chance to talk to the people behind these largely independent and local businesses. They provide great resources, for me, not just in the goods that I buy and the contribution they make to the local economy, but also as inspiration for my business writing. I may not know the detailed ins and outs of their businesses, but keeping the people of my local business community in mind grounds what I write in reality. And that helps what I write about business sound authentic and human. That was my favourite word on Tuesday. It sounds like a tree full of chimpanzees with a bowl of trifle. A perfect word for a day of travelling north on the train. Watching the waves and the rain through the window. 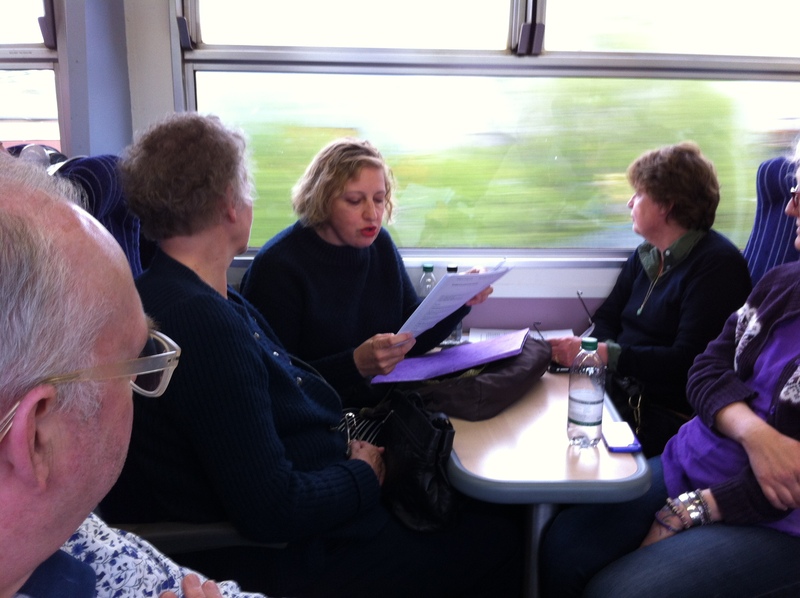 Arriving in Edinburgh to the skirl of the pipes and a bustle of excitement at visiting the Book Festival. Meeting Lesley in a whirl of a hug and setting off walking, talking ten to the dozen. Drifting through the street theatre, finding a warm café and settling down with cake and coffee and more chat. Dodging the raindrops and ducking into the gallery in search of art and landscapes and portraits that looked freshly painted. Smiling at Vincent’s silver trees and light shadows between the clouds on a hillside. Parting with plans ready made for another meeting. And then solo, finding my way through the street magic to a quiet enclave of tents, books and stories. My favourite writer greeted with affection by an appreciative crowd. Remembering the last time we were together in this place when two mischievous authors tested the skills of the sign language interpreter. Mr Gaiman tells his enraptured gathering of short stories that won’t stay short. Of the old country over the duckpond. Of the older country that sank and the even older one that blew up. And stories, stories, stories. Those told and loved. Those waiting for the right moment. The rare one that came dream bound and perfect. Going to Hell in a hot air balloon. Vikings sailing to Jerusalem. A wild head full of dark, bright imaginings and always the promise of more. And later still, more writers, more words from Dark Angels Jamie Jauncey and John Simmons. Words loved and hated. Words mangled out of meaning. And the clear sharp minds that cut through like a skater on a lake. A reminder that writing should be kind, human. That being a writer is about simply being. Right now in the moment. When I return home, much later and more weary, a million shades and colours dance in my dreams.